Hope led the nation in attendance in all three sports for the second consecutive school year. The Flying Dutchmen topped Division III in home basketball attendance for the 13th consecutive time with an average of 2,331 fans per game. Women’s basketball was first in Division III for the seventh consecutive season with 963 fans per home game. The national champion volleyball team drew a Division III-high 830 fans per home match. Hope volleyball coach Becky Schmidt said she and her players are grateful to the Hope and Holland community for the support they give us every year. The Flying Dutch posted a 12-1 home record en route to a 34-2 overall record that included the first volleyball national championship in school history. A total of 10,784 fans came to Hope’s 13 volleyball matches at DeVos. The Flying Dutch drew 206 fans more per match than Calvin, which ranked second in the nation in home attendance. 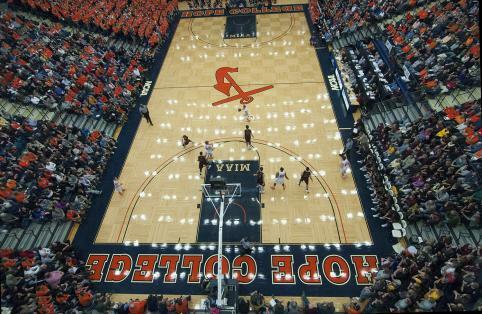 In men’s basketball, Hope drew 27,972 fans to DeVos for 12 home games/sessions. Coach Greg Mitchell’s Flying Dutchmen averaged 731 more per home games than Wooster, Ohio, which was second at 1,620. Hope finished with a 9-3 home record and went 18-9 overall. This is the 17th time overall Hope has been the men's basketball attendance leader. The Flying Dutchmen also led Division III in home men's basketball attendance in 2013-14, 2012-13, 2011-12, 2010-11, 2009-10, 2008-09, 2007-08, 2006-07, 2005-06, 2004-05, 2003-04, 2002-03, 1998-99, 1995-96, 1990-91 and 1983-84. Spurred by Hope, the Michigan Intercollegiate Athletic Association reclaimed the top spot in men’s basketball with an average of 806. The conference led Division III in attendance for 22 consecutive seasons prior to being knocked off by the College Conference of Illinois and Wisconsin in 2013-14. Division III teams averaged 386 fans per game this season, drawing a total of 1,915,186 to 4,956 games/sessions. In women’s basketball, Hope averaged a Division III-high 963 fans over 14 games/sessions last season while going 12-2 at DeVos and 25-5 overall. Coach Brian Morehouse’s Flying Dutch drew 13,478 fans over 14 games/sessions to surpass second-place Franklin, Indiana by 83 fans per game. This is the eighth time the Flying Dutch have led Division III in women's basketball home attendance. They join teams from 2013-14, 2012-13, 2011-12, 2010-11, 2009-10, 2008-09 and 2005-06. Hope helped the MIAA place second among Division III women’s basketball conferences by averaging 361 fans with a total of 38,945 fans over 108 games. The Iowa Intercollegiate Athletic Conference finished first with a 487 average (45,251 over 93 games). Division III women’s teams averaged 219 fans per game this season with 1,164,082 fans watching 5,316 games/sessions.